In a previous column I discussed the amazing work of Clara Lindberg (AuntieClaras.com) using the partial gel effect for artistic purposes. This month features her pioneering work exploring the phenomenon of Glycerin Rivers, a crackling of soap texture seen by some as an annoying problem and by others as an exotic feature. Clara’s experiments have gone a long way toward finding the conditions under which rivers appear, but many interesting questions remain unanswered. This article reports my progress on these issues, working with my students, Myshak Abdi, Adam Christenson, and John Sheffield. Clara’s experiments found that the phenomenon depends on several factors. Rivers only appear in high water soaps that have reached a full gel while containing a colorant such as titanium dioxide. If any of these factors are missing, no rivers appear. The photo at the top of the page illustrates this nicely. She made a log using a single batch of high water soap (1:2.4 NaOH:Water). She divided off one third of the soap and added titanium dioxide and ultramarine blue. 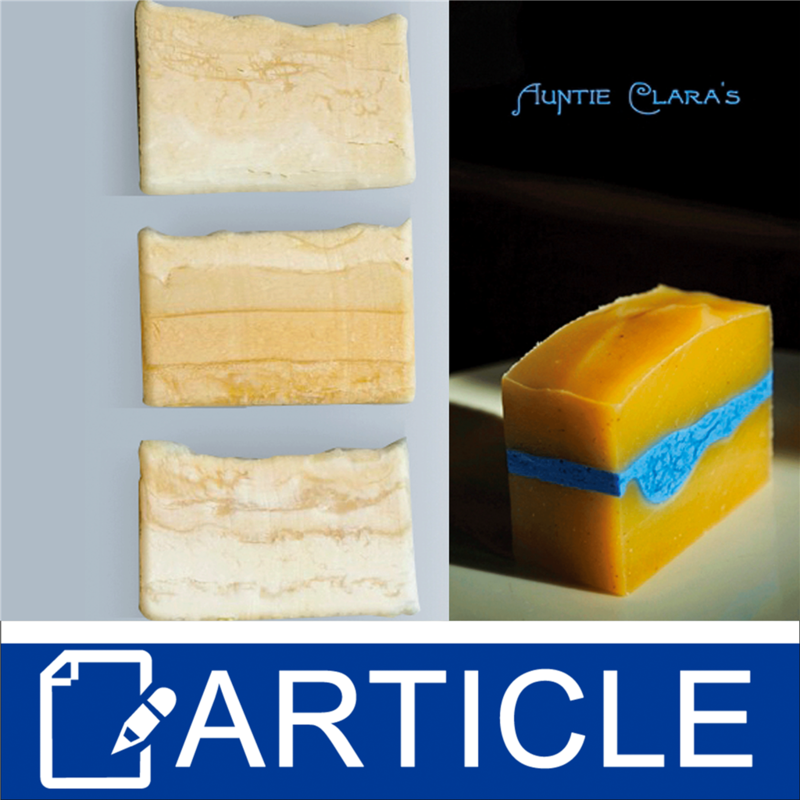 She then poured in three layers, sandwiching the colored soap between two uncolored layers. The log was oven processed in the mold to ensure full gel for the entire log. Rivers only appear in the colored layer. In another experiment two soaps were poured side-by-side, both colored with titanium dioxide, identical except for the lye/water ratio, 1:2.4 on one side and 1:1.4 on the other. The high water side gelled during oven processing and revealed rivers when cut. The low water side did not gel, and displayed no rivers. Our subsequent work has explored additional questions about the phenomenon. Is there a threshold water concentration? Is time a factor? Is glycerin important to the effect (given the name)? Are the “rivers” actually glycerin? I believe we have made some headway on each of these questions. Figure 1 shows slices of three logs of soap. Each log contained 390 g olive oil, 280 g palm oil, 280 g coconut oil, 50 g castor oil, 144 g of NaOH, and a slurry of 4 g of titanium dioxide with 4 g of glycerin. The water portion for each log is described below. They were poured into rectangular log molds, and were processed in roaster ovens to ensure full gel. The bar on the left, called “Gradual Rivers,” consists of 10 layers of soap, each with a different water portion. It started as a low-water soap with a lye/water ratio of 1:1 (50% NaOH). The soap was mixed with a stick blender to a thin trace, and 10% of it was poured into the mold. More water was blended into the remaining soap, and another layer poured. More water was added to each subsequent layer, such that the top layer had a lye/water ratio of 1:2.9 (26% NaOH). The log was then processed at 160º F (70º C) for 4 hours. True to the name, rivers show up gradually in this soap. The bottom layers are indistinguishable from one another and contain no rivers at all. The river phenomenon begins about 2/3 of the way up the bar and becomes more pronounced with increasing water portion. The lye/water ratio at the 2/3 mark is approximately 1:2.2 (31% NaOH). Clara’s values of 1:2.4 and 29% are comfortably on the high-water side of this threshold. The middle bar of Figure 1 is the “Time Test.” One kg of Duckbar’s Delight was divided into four 250 g portions, each colored with a slurry of 1 g titanium dioxide and 1 g glycerin. Four identical lye portions were produced, each containing 36 g of NaOH and 86 g of water. The first batch was mixed with a stick blender, poured into the mold, and processed at 160º F (70º C). After an hour, the mold was removed from the oven, the top of the first layer was brushed with glycerin, a second batch of soap was mixed and poured on top of the first, and the mold was returned to the oven for another hour. The glycerin between the two layers was intended to make it easier to see the boundary between them. This procedure was followed for two more layers. Consequently, the bar consists of four layers, identical except for the time spent in the oven. The bottom layer spent a total of four hours in the oven, and the subsequent layers spent three, two, and one hour, respectively. It is quite evident that the longer the soap spent in gel phase, the larger and more defined the rivers became. As an added bonus, the glycerin between the layers produced a river of its own—an intentional river. This means that you can pour two layers of soap, and define the boundary between them with a glycerin canal (an intentional river, right?). You could even sculpt the surface of the first layer at thick trace to produce a canal with any shape you want. The crafting possibilities seem limitless. The bar on the right of Figure 1, “Glycerin Torrents,” is a four layer bar, each containing a different amount of additional glycerin. Of course, all CP/HP soap contains some glycerin, a byproduct of saponification. The portions were the same as in the Time Test. The 250 g of oil for the bottom layer was colored with a slurry of 1 g titanium dioxide and 1 g of glycerin. The slurry for subsequent layers contained the same amount of titanium dioxide, but 5 g, 10 g, and 20 g of glycerin, respectively. It is quite evident that added glycerin amplifies the effect. We have found that for rivers to appear, the lye concentration needs to be less than 31%. Rivers are more pronounced the longer the soap remains in gel phase, and additional glycerin amplifies the effect. Do the rivers actually contain glycerin? That’s a topic for another column.